This shirt is cut in the western style, does up with snaps, and is a very bold orange and blue plaid. Some might think it’s red, but I’ve actually held this shirt in my hands, and to me it looks very orange. In About a Boy (10x12), this is one of three shirts that we see Dean wearing in the research montage at the beginning of the episode – he is wearing it when Sam comes into his room to tell him about the case and persuade him to leave the bunker. 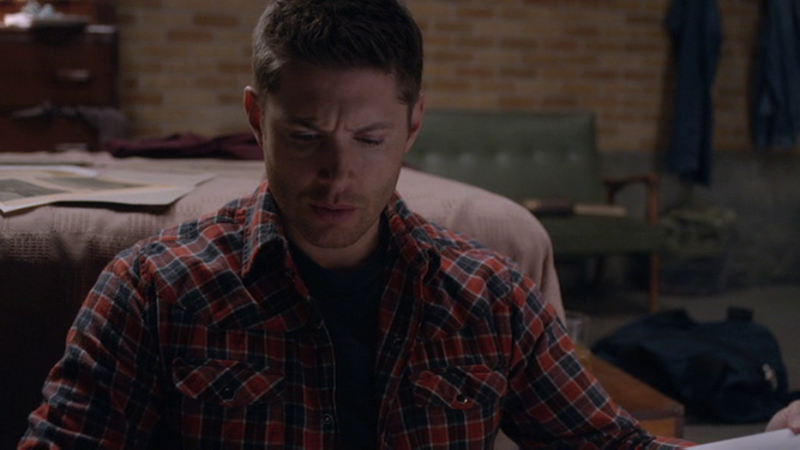 In The Chitters (11x19), Dean wears this shirt when he is in the Bunker at the beginning of the episode. In LOTUS (12x08), Dean wears this shirt when he gets back to the Bunker with take-out and they begin trying to figure out who Lucifer is possessing now. He is still wearing it when Crowley visits with information – but has changed by the time they are planning how to get access to Lucifer. In The British Invasion (12x17), Dean wears this shirt the morning after their drinking night with Mick. I do like this shirt. He only wore it once in S10?